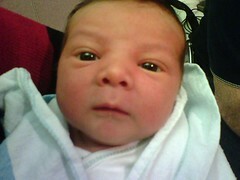 Wide-eyed and blinking, Isaac Faris Smith was born at 2:18am on Monday, December 18th, 2006, with a full head of hair. He was a big boy at 8lbs, 15oz and 20 inches long. He’s very well tempered, and quite handsome indeed. Tina is doing pretty well; we had a rough go of it yesterday (did I mention he was a *big boy?*). She’s improving with each day, though, and we hope to be out of the hospital by tomorrow or the next day. We want to thank everyone for their kind wishes, love and support! As of 7pm on Wednesday, December 20th, Tina and Isaac have been discharged from the hospital and are back at home. Tina is going to need some physical therapy and is walking slowly, but is making great progress every day. We’ve posted new photos! Go take a look at some new photos of Isaac. What a beautiful, BIG baby boy!!! We are very proud grandparents!! You and Tina did good! He’s beautiful! I can’t wait to meet him! I showed Hannah his picture and she was reaching toward the computer screen. Love at first sight! Isaac looks wonderful! We are very happy for the three of you. Congratulations. Congratulations, he is very big and handsome (GUAPO) I hope we can see him soon, and get to meet all the primos………. I’m so filled with happiness for you…that your love has grown to three. He is quite a gorgeous little one. What a beautiful name Issac Faris, very notable and distinguished. Sounds like Tina had a rough time but each day will be better then the last. I know she is well taken cared of and loved. See you soon and Happy Holidays. Parveen. Wow… sounds like quite a trip. I know (or pretend to know, vicariously) the difficulty of birthing big babies. Hang in there Tina! And the boy… what a beauty. Nice work guys. Wow Guys. Congrats. I am so excited for you & Tina. Hopefully I will see him sometime now that I am 8 hrs away. All the best. He looks perfect.